Adjustable holder to attach 7″ to 9″ diagonal screen size tablets with standard 1/4″- screw thread. Adapter width: 4.8″ (12cm) – 7.8″ (19cm) with a secure lock. Supports large phones (phablets) in portrait orientation. Phone’s width must be larger than 7cm. Made from high quality plastic and soft protective rubber for extra durability and protection. Quick release mount plate and legs allow you to remove your camera and fold up the tripod quickly. Suitable for both indoor and outdoor use. Supplied with travel bag for the photographer on the move. Quick release leg locks enable the tripod to be extendable from the folded height of 53cm (21″) to 140cm (55″) when the gearless extending centre pole is at its maximum. Adjustable width between 4.8″ (12cm) – 7.8″ (19cm) with built in lock and release switch. You can hold your tablet by portrait & landscape orientation according the size of your tablet. Non-slip rubber feet help to balance your tripod on uneven surfaces. A weight hook also helps to provide extra stability (Weights not included. Maximum recommended load 3kg (6.6lbs). 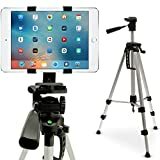 This entry was posted in Discount Photography and tagged Aluminium, Apple, Bracket, Case, Complete, Extendable, Holder, iGadgitz, inch, iPads, Mount, Portable, Screw, Sections, Tablet, Thread, Travel, Tripod by Ball Photo. Bookmark the permalink.